EN 60546-2 ed. 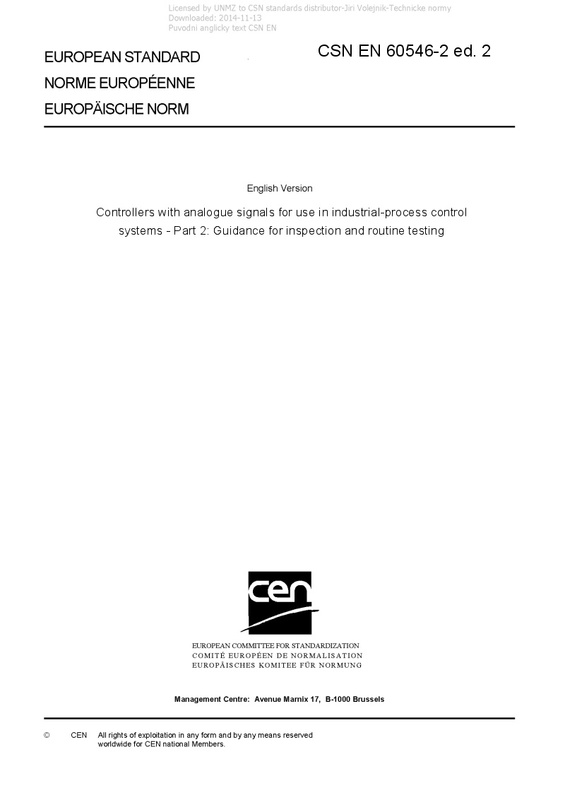 2 Controllers with analogue signals for use in industrial-process control systems - Part 2: Guidance for inspection and routine testing - IEC 60546-2:2010 applies to pneumatic and electrical industrial-process controllers using analogue signals which are in accordance with IEC 60381-1 and IEC 60381-2. The provisions of this standard are applicable in principle to controllers having different, but continuous signals. It provides technical guidance for inspection and routine testing of controllers, for instance, as acceptance tests or after repair. For a full evaluation, IEC 60546-1 should be used. Quantitative criteria for acceptable performance are established by agreement between manufacturer and user. The requirements of this standard are effective when agreed upon by the manufacturer and the user. This second edition cancels and replaces the first edition, published in 1987. It constitutes a minor technical revision made to bring some terms, measurement units and references up to date.